The Custard TV: Line of Duty: Episode 2 poses more questions. Line of Duty: Episode 2 poses more questions. Just excuse me I'm still picking up my jaw from the floor after last week's utterly gripping opener. Jed Mercurio is a master. I don't know how he does it, consistently delivering engrossing series year after year. Let's get you up to speed. 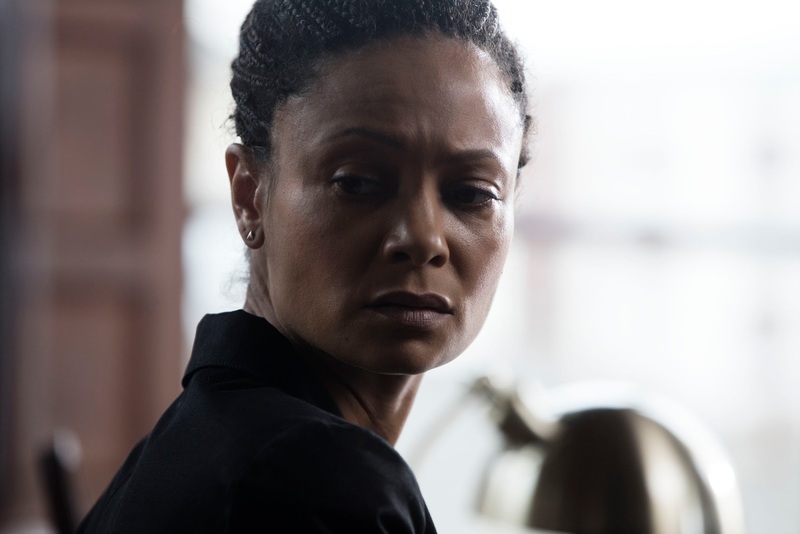 Thandie Newton's Roz Huntley is the focus of this new series. She's under the AC12 microscope after the swift arrest and charge of educationally challenged Michael Farmer following the brutal deaths and kidnapping of three girls. Huntley has been under pressure to close the high profile case and when items belonging to the other victims turn up at his property it seems cut and dry. 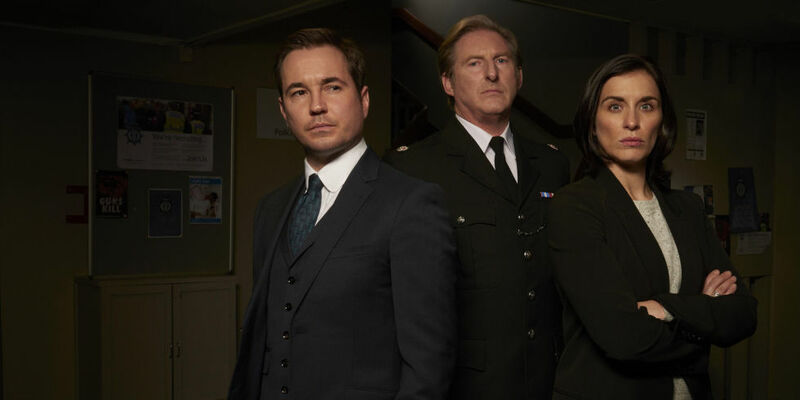 Whilst Huntley and her team are busy celebrating the end to the case Forensic officer Tim Ifield (the brilliantly edgy Jason Watkins) brings contradictory forensic findings to AC12's Steve Arnott (Martin Compston). Ifield informs AC12 that no forensic evidence was found that would link Farmer to the girls and that balaclava man' is still walking free. With their interest peaked AC12 send Kate undercover to ruffle Huntley's feathers. The first episode was practically perfect with writer Jed Mercurio expertly plotting each moment to lead to a breathtaking final sequence that saw Huntley and Ifield confront one another. In the struggle Huntley falls and hits her head in Ifield's kitchen. Is she unconscious? Is she dead? We know from past experience that Jed can pull the rug from under you. Last year even the press where led to believe that Daniel Mays would be the focus of the third series, in reality he didn't live past the first episode! Ifield doesn't panic when Huntley falls instead, he carefully plots his next move. 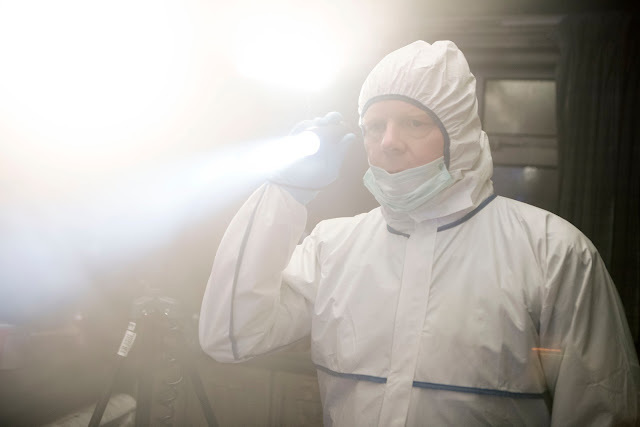 He uses his forensic nohow to expertly clean the scene. As if the previous scenes hadn't been shocking enough we see him wearing a balaclava! Could he be the killer that Huntley and co have been searching for? If so, why would he take focus away from Farmer and why would he bring in AC12 to investigate? The whole sequence is an assault on the senses as I tried to comprehend all that Jed was throwing at me. As the calm and calculated Ifield places Huntley on a plastic sheeting, and fires up a saw Huntley opens her eyes and the credits roll! In this era of binging on shows I could've easily sat and let the next one play, but in retrospect this is a show that needs time to breathe. You need the seven day gap to fully process and analyse the incturities of the plot. As the second episode opens Huntley and Ifield are still missing and Huntley's team, which now includes Kate deep undercover, have found the dismembered body of a female in woods. Surely they've not stumbled across Roz Huntley? Just when you think Ifield and Huntley's exchange has come to a nasty end, Huntley appears in her office to brief her team on the new body. So, how did Huntley, who was laying on plastic sheeting in Ifield's kitchen leave the flat and what has happened to Ifield? What follows is a Line of Duty staple. The series, which started to little fanfare in 2012 has become synonymous for its long interrogation scenes where AC12 grill their suspect laying all their evidence on the table. These scenes cause longtime LoD fans to salivate. They're long, tense, full of police jargon and unlike anything else in TV drama. Fans will know to expect this, and will be looking forward to them but I wonder whether a BBC One audience who are not expecting such a dialogue heavy scene will label this as 'slow'. The scenes showcase Line of Duty at its best. It's not plodding, it's precise. Huntley handles her time with AC12 with relative ease, only stumbling when shown a picture of 'balaclava man' she hadn't seen before. Her feathers are ruffled further when the great Ted Hastings tells her he'll be recommending she be taken off the case nicknamed 'Trapdoor'. With Kate now inside Huntley's team, she's shocked to discover that the person taking over from Huntley, DCI Buckles, is someone she recognises and more importantly he's likely to recognise her. In a scene, unlike anything I've seen in Line of Duty before, Arnott and Hastings confront Buckles and warn him off of exposing Kate as working for AC12. It's a scene that showcases the length AC12 will go to to keep their operations running smoothly. Back with Roz and we learn she has a black binbag in the boot of her car. This binbag appears to contain Ifield's laptop, she also appears to know all his passwords. So, where is Ifield and what has Roz done with him? We're not the only ones pondering his sudden disappearance, Steve Arnott pays a visit to his home after being unable to locate him over the phone. A suspicious Arnott makes his way into the building but is stopped when Huntley and her team arrive to take over the scene. Much to Arnott's annoyance he's powerless to stop Roz and co from entering. They find Ifield dead of a neck laceration. He's also loosing digits on his hand. Huntley stays uncharacteristically quiet as her team go over the Ifield's flat. It's here we get the first sense that Huntley isn't the uber-confident, self assured woman Mercurio's script had first had us believe. She's visibly shaken by being back at the flat and Mercurio now paints her as someone completely out of her depth. We're still unsure whether she has killed Ifield or not but she is clearly nervous and uncomfortable. When traces of her blood on the worktop could place her at the scene though, Huntley reverts to the bulldog we've known her to be. Cleverly swapping the evidence bag with splatter from Ifield's clothes that she's been keeping that life saving black binbag. It's a clever device that keeps the audience on their toes. We're never entirely sure how to feel about Huntley. Is she behaving this way because she's committed a murder or is she just erasing her presence at the flat and her cleanup is another way of avoiding awkward questions? Thandie Newton has a difficult balancing act. As an audience member you're never supposed to hate Huntley no matter how unscrupulous her behavior. Line of Duty isn't about good guys and bad guys it's about people out of themselves and the lengths people will go to save their own skin. In another deviously clever move Huntley uses Ifield's DNA to link him to part of the dismembered torso that the team found in the woods. This revelation shocks the team and leads to Huntley's boss ignoring AC12's recommendations and putting Huntley back in charge of the entire investigation. She may've started the episode on the backfoot but she's back in control and front and centre of anything pertaining to balaclava man and Tim Ifield. I have nothing but praise for Jed Mercurio who wrote AND directed this episode. The characters are incredibly well drawn and believable. It's an engrossing story that demands your attention and rewards you for it at every turn. We're still very much in the dark. Is Huntley really crooked? Is she being controlled by people above her? Is the capable of the murder of a colleague? Who is balaclava man? One thing's for sure, it's going to get a lot more absorbing in the episodes to come. I may have to invest in a megaphone, find the nearest rooftop and insist people are watching so that everyone can share their theories in the LONG week between episodes. Line of Duty Continues Sunday at 9.00pm on BBC ONE. I am still wondering why Ifield would hire one of the victims to clean his flat. What was that all about? Even if she is a babe! Having Arnott suspecting Huntley in the murder of Ifield seemed like a bit of a stretch for me. I think Huntley's husband may be the actual killer. I'm looking forward to the next episode and I will check your review after. Thanks. Masterpiece on every level. Line of Duty has ruined it for ever other television drama. Two episodes of genius and four to go. Best thing I have seen since the last one. Honestly why do other dramatists even bother? Oh and while you have your megaphone out, maybe try to blast open the brains of people watching lazy and poorly written drivel like Vera and Broadchurch who haven't had to exercise those little grey cells and get them to upgrade to Line of Duty. Sure you have to work a little harder but why eat pot of noodles when you could be feasting on this banquet? Slightly confused by the ending. I see why Huntley would want Hilton to assist in a cover-up about evidence linking Ifield to the 'balaclava man' killings. But why would she gather all the coppers on her team together to hear that evidence? Does she think they'd all go along with a cover-up? Maybe she's playing the long game and wants to pin any wrongdoing on Hilton. I hope Huntley's husband isn't the killer. The husband of the investigator being the killer is too similar to the first series of Broadchurch. I have to admit that did cross my mind. You don't hire a face like Lee Ingelby if he doesn't have anything to do. I have faith in Jed and if it's too similar you'd think someone somewhere would pipe up and say "they did that in Broadchurch." Since much of this series so far is about gender politics, I kinda hope that they have hired Lee Ingleby in the 'thankless spouse role'. How often have well-known actresses been cast as the wife of the protagonist and not given much to do?